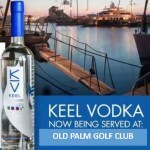 Old Palm members recently enjoyed a tasting of Keel Vodka at the Club, and the founding partners of this premium vodka were on hand to extol its virtues. Keel is made at a boutique distillery in Idaho and uses Rocky Mountain snowmelt to create its distinct smooth taste. The vodkaâs marine-inspired name comes founders Bill Dessel and Tom McGowan being native Rhode Islanders who grew up by the ocean in and around boats. The third founder, Matt Light is a former New England Patriot, three-time Super Bowl champion and three-time Pro Bowler. Keel Vodka was born out of their friendship and love of the sea and life. It is a premium light spirit known for its ultimate taste and smoothness. Created, distilled and bottled in America, Keel only has half the calories of regular vodka. As our members discovered during the sampling of the vodka at a recent Pub Night, Keel tastes great straight or mixed into a light, breezy drink.